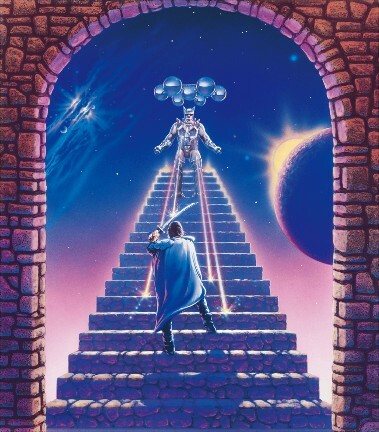 In the Phantasy Star Complete Collection galleries, this version of the Phantasy Star III non-Japan releases' cover artwork is featured. Unlike the Phantasy Star II counterpart, this art was not heavily obscured by logos or other design elements on the packaging. The only thing overlaid was on the art the Sega Genesis or Megadrive logo, which covered only the very top center of the stone arch. However, the art was reversed in a mirroring effect for some unknown reason. It is unclear if the mirroring was used in the game cover or this specific image we see here.